As the Senate moves to consider reforms to restore a talking filibuster, lobbyists who thrive on secrecy and corporate obstruction fight back. As momentum builds to reform the horrendously broken rules of the Senate, a cadre of Washington D.C. politicos are fighting back, arguing that the filibuster in its current form must be preserved. 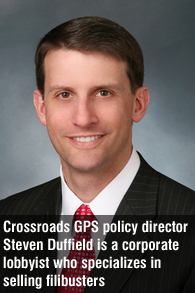 Last week, Steven Duffield, in an opinion column for The Washington Examiner, pleaded for the status quo, claiming “Senate liberals want to gut” the filibuster, which he called a “long-standing protection for minorities.” Duffield, bylined simply as “vice president for policy at Crossroads GPS,” didn’t point to any examples of filibusters protecting the rights of minorities or marginalized groups. He listed other complaints, like the charge that rules reform will allow the Senate to “rubber stamp” Obama’s nominees to the Supreme Court. In reality, the proposed reforms do not affect appointments to the Supreme Court. And a more comprehensive reading of the filibuster’s history would show that when it comes to civil rights for oppressed minority groups, the filibuster has actually served as a great obstacle for justice. Maybe Duffield is alarmed about rules reform—which would limit anonymous holds, allow for a “talking filibuster” and expedite deliberations for some nominees—for another reason: his pocketbook. Managing Holds and Filibusters. Your organization has an interest in a bill that has proven controversial and you require advocacy before those legislators—often backbench Senate Republicans—who may exercise their prerogatives to delay or obstruct. Endgame Strategies will give you new ways to manage your interests in a legislative environment that gives great power to individual senators. Duffield, a former Senate aide to Arizona Republican Jon Kyl, literally sold filibusters, anonymous holds and the other forms of obstruction. In 2011, he reported at least $230,000 in lobbying fees. 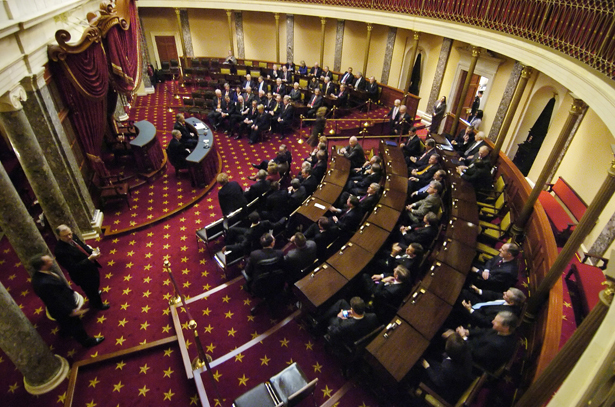 Current rules allow a senator to secretly block any legislation or nominee and then, without actually performing a talking filibuster, require a three-fifths majority vote—twice—to proceed eventually with a regular majority vote, a process ripe for abuse by well-connected political operators of both parties. I’ve detailed before how lobbyists, even agents for foreign governments, have secured Republican filibusters at a shocking rate. The cottage industry around monetizing filibusters has grown rapidly since Obama’s first election. From 2009 to 2010, there were more filibusters filed than during the 1950s through 1960s combined, as The Nation’s Katrina vanden Heuvel observed. • Senator David Vitter (R-LA) placed holds on Obama EPA nominees to delay scientific assessments on the health risks of formaldehyde, which is produced by some of his largest campaign contributors. • According to a new report from Public Campaign Action Fund, Republican Senate Leader Mitch McConnell (R-KY) has collected a hundreds of thousands in funds from the same industries he has protected with filibusters, particularly from oil companies and the finance sector. McConnell has led filibusters to protect oil subsidies, to block efforts to mitigate the mortgage crisis, and against campaign disclosure reforms. • Senator Richard Shelby (R-AL) placed a “blanket hold” on every Obama nominee to force the administration to accept a Northrop Grumman contract to build a $35 billion refueling tanker in Mobile, Alabama. Northrop Grumman is a major Shelby donor. • Senator John McCain (R-AZ) blocked the nomination of one of Obama’s most important Department of Labor nominees for months, which many believe led the US Chamber of Commerce to aggressively support McCain during a contentious primary with a Tea Party–backed candidate in 2010. • Senator Mary Landrieu (D-LA), a close ally of the oil and gas industry, temporarily blocked Obama’s nominee for the Office of Management and Budget to extract an administration promise to allow more oil drilling leases in the Gulf of Mexico following the Deepwater Horizon catastrophe. • Senator Bob Corker (R-TN) filibustered the Federal Aviation Administration reauthorization bill in order to demand a policy that prevents FedEx drivers from unionizing. FedEx is Corker’s third-highest campaign donor. At the nexus of all of this obstruction are lobbyists who are making a small fortune negotiating these tactics. The National Rifle Association is one of the most powerful lobbying groups in Washington. See how the organization helps the gun industry reap even greater profits following gun-violence tragedies.